I’m sure you’ve heard it before don’t pat your horse! If you’ve not heard it before you will eventually. Some people feel that patting a horse is offensive to them and I agree if it’s a slap. No one likes to be slapped, but patting is different. I remember growing up my grandmother would pat me gently on the back and it was so comforting. I don’t believe the horse finds it offensive if you pat them gently. I recently had to do this with a stallion that I own in order to desensitize him. I purchased this stallion from a breeder that does not handle their foals so he came to me as an untouched 2 year old. After working with him for several weeks using positive reinforcement I was able to get a halter on and off of him. I worked with him in his pen because at times he would get spooked and try to bolt away from me and I sure did not want to take a chance of him getting away from me and running off. After a few months he started bolting away just as I was about to get the rope halter tied on him. The first time he did this I thought maybe he got scared of something. I don’t like them doing this because they soon learn you can’t hold them and it becomes a bad habit. After the second time he bolted away I knew I had to do something different to stop this behavior. This is what I did to help him overcome the behavior. I put his hay in a large muck bucket and went into his pen and then put the bucket down in the middle of the pen and stood there. When he approached and would allow me to touch his head I gave him a bite of hay. I did this for several days. After he was comfortable with me touching his head I then started touching his neck from both sides. When he was accepting of me touching him on both sides of the neck I then went to waving my hand around in the air. I did all of these steps over several days as I was building up his trust and desensitizing him to all of this. Next I moved to petting him with a short rope draped over my arm so he could get used to that. There were several other things I did before I was able to get the halter on him. I knew it was going to take time with him in order to get the halter back on him so he would not bolt. I had no intention of pushing him and had it in my mind that I would take the time he needed. You see you have to break things down into simple steps and take the time the horse needs in order to build their trust. I also found that gently patting him on the neck built his confidence and now I am able to put the halter on him without him bolting way as he is no longer worried about things. You hit the nail right on the head. I would have to agree, slapping the horse is not a pat. Do you think scratching or ‘rubbing’ the horse would offer more of a soothing, rewarding application. I like where you say you broke things down into manageable steps. Manageable steps for you and for your horse. Very important to take your time and not miss any steps. This is where so many people get in a rush and then when the chips are down, things get un-stuck and the horse starts to bold again. Sometimes it just takes time and patience to understand and break down the barriers. Let us know how this horse progresses. I had a friend who had a horse which was terribly head shy and she did similar things until the horse became trusting of her (and hungry enough) to allow her to touch her head and ears. 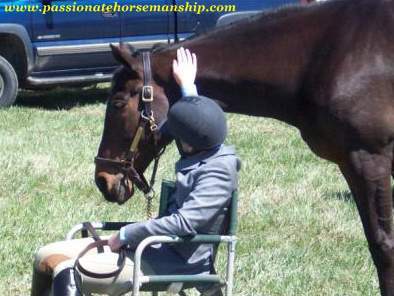 I believe that touching, patting is connecting with the horse. They are amazing animals. And just like with people – trust needs to be build. Yes they are amazing animal and it is so important to gain their trust. Thanks for your comment. it sounds like you spent some rewarding time with this stallion. So glad to see you were able to connect with him. I find each horse is different in terms of where they like to be touched – and how. Thanks for underscoring the importance of taking small steps to gain a horse’s trust. I’m with you Nanette as I too find each horse different just like with people. I am all about the horse and that is why I take the time they need. Thanks for stopping by. Love it Kim. I’m not a horse person any more, but yours is a very compelling story. Oh Hale Yes! Thanks Hale I appreciate you taking the time to leave a comment. Interesting, I haven’t heard before that we aren’t supposed to pat a horse. I have been horseback riding several times and pat the horse I was riding without any comments from the owners. Of course, I pat them the way I would pat my baby on the head, the dog, or my grandma’s hand. I will definitely be saving your info for the future when we are ready to enter the world of horse ownership! I can’t help myself as I pat all of my horses just comes naturally to me, but there are people out there that will tell you not to pat the horse. When you get a horse I look forward to hearing more about him or her. Kim, that’s a beautiful story. What you said about “… you have to break things down into simple steps and take the time the horse needs in order to build their trust” is true with people too. Thanks & happy new year. Your right about building the trust with people too as it is very important. Thanks for your comment.